This week's theme continues last week's, underwater movies. 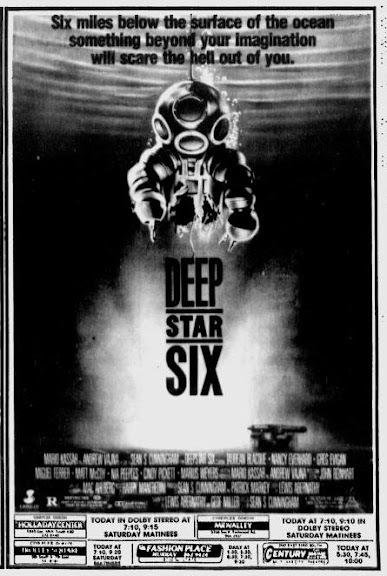 Here's an ad for Deepstar Six. I've always loved the look of this movie's poster, but I've never seen the actual movie. The synopsis is very similar to The Abyss; a group of underwater explorers in a nuclear sub disturb an alien presence on the bottom of the ocean. It stars Greg Evigan, Nia Peeples and Miguel Ferrer. See other underwater movies here.